Representatives from Minot State University, Lake Region State College and the North Dakota School for the Deaf/Resource Center for Deaf/Hard of Hearing signed a Memorandum of Understanding Nov. 18. A Bush Foundation Grant with a match from the Higher Ed Challenge Fund will assist in the development of a program to increase access for deaf or hard-of-hearing individuals. An innovative “2+2” program enables students to complete an Associate of Applied Science degree in American Sign Language and interpreting studies with LRSC and then transfer to Minot State to complete the Bachelor of Applied Science degree in interpreting and sign language studies. Students can take the entire program from either campus or from a remote location, where courses are delivered via interactive live video technologies. Located in Devils Lake, the N.D. School for the Deaf/Resource Center for Deaf/Hard of Hearing provides support to both LRSC and MSU through consultation and practical opportunities. Pictured, left to right, are David Zimmerman, N.D. School for the Deaf; Shevonne Putnam, MSU special education instructor; Holly Pedersen, MSU Department of Special Education chair; Doug Darling, LRSC president; Lisa Ginther, LRSC instructor; and Steven Shirley, MSU president; and Laurie Geller, MSU vice president for academic affairs. For questions, contact Pedersen at holly.pedersen@minotstateu.edu or 858-3846. Dave Thompson, Prairie Public news director, will give a legislative session preview Tuesday (Nov. 29) at the next Democracy Cafe at Broadway Bean and Bagel from 9:30 to 10:45 a.m. Democracy Cafes, which are free and open to the public, foster nonpartisan discussion on important civic issues. This Democracy Cafe is funded by Minot State University’s College of Arts and Sciences. For questions, contact Jynette Larshus, assistant professor of sociology at 858-4324 or jynette.larshus@minotstateu.edu. Tuesday (Nov. 29), 1-3 p.m. in Old Main 314 — “Intermediate Excel by Jan Repnow, business information technology assistant professor. 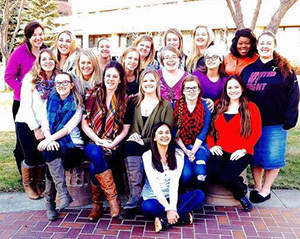 For their senior project, Minot State University semester IV nursing students will screen “Someone You Love: The HPV Epidemic” Dec. 1 in the Conference Center at 6 p.m. The documentary tells the stories of five women impacted by the Human Papilloma Virus. The students wish to raise awareness about HPV cancer prevention. Vaccines will be provided on site to MSU students following the presentation. A panel of experts, consisting of local doctors and nurses, will be present to educate and answer questions. Prizes for those who attend will also be given. For questions, contact Combs at elizabeth.combs@my.minotstateu.edu. The Heritage Singers, Voices of Note, MSU Concert Choir and area community members will perform Handel’s “Messiah,” one of the longest running traditions at Minot State University, Dec. 4 in Ann Nicole Nelson Hall at 4 p.m.
Minot Symphony Orchestra members and community musicians comprise the orchestra. Carlos Vieira, MSU choral director and music associate professor, will conduct the concert. The production is open to the public, and admission is by freewill offering. As in the past, proceeds from the performance will go to the Joseph Hegstad and John Strohm Memorial Scholarship funds. The concert will be taped and locally televised over the holiday season. For more information, call the Division of Music at 858-3185. Minot State University’s Campus Players production of John K. Alvarez, Michael Carleton and James FitzGerald’s “Every Christmas Story Ever Told (and Then Some! ),” directed by Eric Fetske, MSU student, will run Dec. 7-10 in Aleshire Theater at 7:30 p.m. The doors will open at 7 p.m.
“Every Christmas Story Ever Told (and Then Some)” recounts how three actors decide that performing Charles Dickens’ “A Christmas Carol” again is the last thing they want to do. So, they put on a show combining every Christmas story they know with some global holiday traditions thrown in. This show has everything anyone could ever want from a Christmas show, and probably more than anyone ever thought of. Tickets are $6 for adults 18 and up and $5 for seniors, MSU students, and children. MSU IDs will not be accepted for admission, as this production is a fundraiser for Campus Players. Reservations can be made by calling 858-3172. The Minot State University Program of Broadcasting will host its 18th annual KMSU Auction Dec. 8. The auction will air live on public access Channel 19 at 6:30 p.m., with a preshow starting at 5 p.m. Bids will be accepted by phone at that time at (701)858-4019. The KMSU Auction fundraises for scholarships and equipment for the broadcasting program. Past events have raised more than $20,000 with 10 percent given to charitable causes. This year, the beneficiary is the Domestic Violence Crisis Center. KMSU promotes local businesses through various media in exchange for donations and then organizes them into packages to be auctioned off in a QVC-style format. Viewers place on-air bids during the allotted time, with the highest bid winning the package. The broadcasting students plan, organize, produce and promote this unique television auction. For questions, contact Janna McKechnie, KMSU Auction advisor, at janna.mckechnie@minotstateu.edu. Andy Heitkamp, Veterans Center director, and Rebecca Ringham, registrar, recently received North Dakota University System minigrants on behalf of the Midwest Higher Education Compact through the state’s participation in the Multistate Collaborative for Military Credit with funding from the Lumina Foundation and USA Funds. Ringham organized a statewide training on options available to NDUS institutions in managing the educational benefits of veterans, service members and their families. Nearly 40 individuals attended the Oct. 27 training in Grand Forks. Heitkamp coordinated training for faculty, administrators and others involved in the evaluation of military training and experiences for the award of credit toward a degree. Small grant funds brought in trainers to aid in evaluating military training and experiences. More than 30 individuals representing public, private and tribal colleges, as well as the National Guard and other organizations that support veterans and service members, participated in the Nov. 3 training at MSU. Lisa Johnson, NDUS liaison to the MCMC and MSU alumna, said the mini-grants were something the steering committee wanted to explore. Pictured, left to right, are Andy Heitkamp, Lisa Johnson and Rebecca Ringham. Nov. 23-30 — “Paradise in the Summer Dark,” paintings by Susana Amundarain, art instructor, Library Gallery. Nov. 23-Dec. 22 — “Missouri Valley Gold,” Plein Air paintings by Greg Walter, Dickinson State University associate professor of art, Library Gallery. Mikhail Bobylev, chemistry professor, and eight undergraduate student researchers attended the 11th Northwest Regional Meeting, “Undergraduate Research in Molecular Sciences,” at Minnesota State University-Moorhead, Sept. 30-Oct. 1. The students presented the results of their organic chemistry research projects that they conducted in Bobylev’s lab. They made one oral presentation and eight poster presentations. For her oral presentation, Jordan Torgunrud won a $500 Travel Award to support her trip to the 253rd National Meeting of the American Chemical Society, April 2-6, in San Francisco. For her poster presentation, Breanne Hatfield won a free registration to the Great Lakes Regional Meeting of the American Chemical Society, June 27-30 in Fargo. Also for the poster presentations, Tess Skinner and Erika Mojica won a one-year membership in the American Chemical Society. Eight of the presented research projects were supported by ND INBRE. Torgunrud’s research was supported by ND EPSCoR. Picture, left to right, are Shin Young Park, Kaylee Dockter, Erika Mojica, Breanne Hatfield, Jordan Torgunrud, Stephanie Sundhagen, Hye Ji Lee, and Tess Skinner. Walter Piehl Jr., art professor, and Gary P. Miller had their original art featured at The Capital Gallery during its Nov. 16 pre-opening reception. The gallery opened in downtown Bismarck Nov. 18.